View of Kingsgate Castle on the Isle of Thanet. 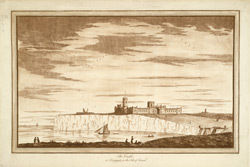 As this print shows, it is situated in an impressive position on a cliff top. However this it not a really castle, it is a folly built in the 18th century by Lord Holland, father of Charles Fox in c.1762-8. Initially he had Holland House built, and then surrounded it with huge follies, built of flint. One was a stable block, built in the guise of a ruined castle from the period of Edward I. Another was a ruin in the style of a coastal fort of Henry VIII.